Chris Cleave – War was declared at 11:15 and Mary North signed up at noon. War was declared at 11:15 and Mary North signed up at noon. NEW: USA paperback out now! The instant New York Times bestseller from Chris Cleave—the unforgettable novel about three lives entangled during World War II, told “with dazzling prose, sharp English wit, and compassion…a powerful portrait of war’s effects on those who fight and those left behind” (People, Book of the Week). NEW: Everyone Brave in video! It’s 1939, and the world is at war. Within an hour of hostilities being declared in Britain, Mary, a headstrong young socialite, volunteers to serve. She is assigned to teach children who have been rejected by the countryside to which they were evacuated. It is in this role that Mary meets Tom, an education administrator in her school district. Their professional relationship quickly becomes personal. But when Mary meets Alistair, Tom’s best friend who has enlisted, the three are drawn into a dilemma that they must navigate while trying to survive an escalating war. Everyone Brave is Forgiven is a sweeping epic with the same kind of unforgettable characters and scenes that made Chris Cleave’s #1 New York Times bestselling novel Little Bee a book club favourite. It is a stunning examination of what it means to love, lose and remain courageous. Chris, you have a good heart. Thank-you for a wonderful book. Like all good reads it works on so many different levels. For me the most poignant was the omnipresent, wanton, arbitrary, destructiveness of war. Young lives are swept from their natural course and thrown, broken and mangled onto the beaches of history. There may be a better world to come, some may survive to live and love, despite all the odds – who knows? You offer no redemptive ending – and kudos for that. I ran ahead of you, into a story where Mary adopts Zachary, and, then, when more black kids fetch-up in the theatre’s basement, she adopts them all; taking them home to her wealthy parents and converting them to love and tenderness, because, as Mary repeats, over and over, Zachary is a child. You were far too wise to go where I went. The sadness of reality and the weakness of the individual are only redeemed at all by knowing that Zachary will grow up. No more, no less. My father manned an anti-aircraft gun mounted on a platform in the Thames. My husband’s mother was a South London kid evacuated to Oxford. She never saw her mother again. Not bombs, cancer. Cancer still went on, regardless. He was twenty. She was eleven. Your storytelling brought me right into their everyday experiences. What was one of those guns like? How does a child feel when denied the protection of a parent? This is the most poignant wartime novel I’ve read since “Testament of Youth”! Superb writing and character development. I’m from Brazil and I’ve just finished reading “Everyone brave is forgiven”. I absolutely loved it! You broke my heart to tiny pieces multiple times and then sewed then back together. Thank you for telling such a beautiful story. It’s of the utmost importance to remember what has passed as to not let history repeat itself. Thanks for reminding us. I have just finished reading Everyone Brave is Forgiven. I loved it and in particular the chapters on Malta as I spent 8 years of my childhood there between 1952 to 1961. When I first went there in 1952 bomb damage was still evident from the war. My primary school was at Cospicua (Royal Naval School Verdala) and enclosed by ramparts which looked out right over to Grand Harbour. My secondary school was at Tal Handaq near Luqa airport. Your description of the Fort St Elmo is spot on. I was there in September partly for a school reunion at Verdala and also to visit my parents grave at the Naval Cemetery at Kalkara. A beautifully kept cemetery run by the War Graves Commission. Your description of Malta is spot on and reading it I felt I was there. I live in Adelaide South Australia. We have just had our Writers’ Week and it would be wonderful if you are invited to attend as a guest writer one year. I shall be recommending the book for my Book Club. Thank you for your lovely comment on my website about Everyone Brave is Forgiven. Sorry it’s taken me so long to reply! I was moved by your message, as I spent some time at the Kalkara / Capuccini cemetery. The Commonwealth War Graves Commission were really helpful to me, too. And yes – isn’t it beautifully kept? It was interesting to see how many pre-WWII graves there were, too. For example I hadn’t realised until then that the wounded from Gallipoli etc had been cared for on Malta. Thanks again for your kind message. I’m a German citizen. I visit London a few times a year, because my daughter studies there. I bought your book by chance. Once I started reading it, I couldn’t put it down. Thank you for sharing some of your history and giving me a further insight on how people perceived the second world war in London. I will def. order more of your books. Thank you, Kerstin – that means a lot to me. I’m delighted you liked Everyone Brave. All good wishes to you & your daughter! Regarding “Everyone Brave is Forgiven”: Your book is timeless and poetic. There are so many unforgettable passages. It was heartbreaking and beautiful, with twists and turns I didn’t see coming. I see that “Incendiary” and “Little Bee” received critical acclaim (I look forward to reading them), this one certainly should as well! Thank you! Thank you, Barbara – I’m very grateful for your kind words. And thank you for reading my books! Finished “Everyone Brave is Forgiven” – loved it! I read your Author’s Notes and wanted to comment. Please don’t feel bad about not sharing with your grandfather. We live with enough regret. Know how many lives you’ve touched with your writing and how he wouldn’t have wanted you to feel bad about it. I read your book Everyone Brave is Forgiven and have recomended it for a book club I belong too. So it will be interesting to get other members feedback next week. Your book so vividly brought back that time for me. I remember it as if it was yesterday. I am 83 and grew up in the greater London Area. Our whole school was evacuated the first day war was declared in September 1939. We boarded buses with our name tags and a sandwich for lunch and did not know where we were going. We had government issued identity cards with an I.D. number, but gas masks were not issued until a few weeks later. We then had to keep our I.D card in the box with the gas mask and carry it at all times. All adults thought the war would be over in a year. Parents brought my brother and I home in August 1940 because of health problems I was undergoing and the Blitz started shortly after. We attended a more local school than the one before, and the school had lots of pupils so not everyone was evacuated. Although we had bombing every day Friday nights always seemed to be more heavily bombed. My father not age eligible for call up, had to do his share of incendiary bomb watching after his days work was over. My parents were also the Air Raid Wardens for the street we lived on. We always had to be at the ready to put out fires. A bucket of sand, and one of water and the stirrup pump had to be on porch at all times. You wrote about the easing of of the blitz, then I expected you to write of the next terror the Buzz bombs. As to milk program I started school at age 4 yrs and remember the crates of milk delivered every day to the classroom. Milk was considered important as many children previously suffered from Ricketts because of lack of calcium. (Think Dicken’s Tiny Tim). During the war milk was rationed, however I do remember when I went to the Grammar school in 1944 we had milk everyday 1/3rd of a pint each, and we paid 2 and 1/2 pence for it each week. (old pence). My eldest brother at 16 yrs was part of the ARP and went digging out bombed buildings. He later joined the Royal Navy and was a radar operator on the destroyers in the Mediterannean, searching for submarines, and was stationed in Malta also at some point. I remember him telling me after the war that the Maltese people almost starved to death. As to Hairspray we did not have that at that time we only had jars of thick sticky hair setting Gel, awful goopy stuff. There were no pump bottles or aerosol cans those came later. I now live in Ontario, Canada, I will confer with my brothers to see if they remember if the milk program halted in the early part of the war, my eldest brother age 93 is in Alberta Canada, still very spry and knowledgeable and my other brother age 85 now lives in Australia. Prior to this book our book club has read Little Bee, and we all loved it. Back to the library I went, to see what else I might find by you, and brought home “Little Bee”. Oh, Mr. Cleave, this book has changed me. Although it was written long before the current refugee crisis, it has so much to say that applies now. The US is several years behind Europe, and we have to find a way to see these refugees as persons, with hopes and dreams just like ours. I have never belonged to a book club, but I would love start one with “Little Bee.” This story, and Udo, will stay with me for a long, long time. I have never been a keen reader. In fact I am a very slow reader and honestly find it quite hard to do most of the time. Around 3 years ago, I came in to possession of The Other Hand. And I devoured it. And then I went out to find Incendiary and was delighted that I finally had an appetite for reading fiction (I study maths at uni so what I usually read is scientific). I was on a roll! Until I moved onto Gold and lost momentum – which I blame on a house move – and left it unfinished. But I rediscovered it last week and loved it. I thought I wouldn’t be able to relate to a book about a sport but it was beautiful and so careful in its storytelling. So I realised I do indeed like to read fiction as long as it is yours, and I was delighted to find you had produced another for me. I borrowed it from the library last week and finished it in 4 days. That is just utterly unheard of. My mum and Grandma are huge readers and they are so chuffed that I too am getting joy from it now. The day after finishing this book, I turned back to the beginning because I missed the characters. Somehow, you made the war seem real to me in a way that history lessons at school and factual accounts and even photographs never could. This is the first of your books I have read and it won’t be the last. It was recommended to me by my book club friend who thought it sounded suitable to read to my 94yr mum who is Maltese and now suffers from macular degeneration. I ended up reading it before visiting my mum in Malta, I am not a fast reader but I found your book and style so easy to read that within a week I had finished. My mum was a young girl like Mary in your story who had just finished her senior Oxford exams and ended up as a bookkeeper in a protection office in Qurmi. My father ended up in Alexandria as an electrical fitter in the dockyard. They had just met but lost contact once the war started.Their life is another story to be written. As I read your book I found parts so moving,I remembered the stories my mother told me about her expieriences. The shortage of food everyone so thin and yet they kept going and joking. Your description of the Maltese island and people is so accurate and true no wonder they were awarded the George cross for bravery. I loved this book so much. It should be made into a movie! I am now reading Little Bee and loving it too. Hi Chris, I have had a tough year feeling passionate about any novel I have read this year and I was beginning to think my study in creative writing and first time novel attempt had some how tainted my view of literature…and then…I read Everyone Brave and my faith has been restored. I adored Mary from the very first page and all the characters to follow. They filled my heart with every human emotion. What a glorious read, I am so grateful. You have peaked an interest in WW2 for me, particularly Malta’s place in the devastation of it all. The book gave me precious time to quietly thank all those men and women that suffered for my freedom as well as cry many tears for the ones that stayed at home and lost so much too. I will keep your book on my desk – a place where truly inspiring books sit to help me when I feel nobody will care about my story – it is because of books like this that I want to write. Thank you for lifting me out of my book funk. I can’t wait to read your other work. Warm regards, Sarah Waddington Australia. PS. Can’t believe you were just in Aus and I missed you – please come back some day. PPS.I did post earlier today but it seems to have been lost in cyberspace – apologies if you have already received a message from me. Dear Chris, this year has been a drought for me in reading books that engage me. I started to wonder if my passion for reading was being infected by my drive to study creative writing and write my first novel. And then… I read Everyone Brave and my faith has been restored. I loved Mary from page 1 and every other character after that. Thank you for bringing me out of my reading funk and into the light – I can’t wait to read your other works and will keep your book on my desk for inspiration. I do not believe it is an easy skill to write war scenes but I hung on every word and detail of Brave. I no longer have anybody in my life who lived through those horrific times and I am grateful to you for giving me the space to grieve for all the sadness and pain that the people of that time suffered. I have also spent the last 2 days googling Malta and am astounded at another area of ignorance in my life – thank you for opening my eyes to a part of history I may never have come across. I hope one day I can write characters that will move and connect people to our history as you have. Writers like you make me NEVER want to give up. The green, jacket she refer dot to, tat the sailors wore at sea was called a foul weather jacket and were real warm. They were not standard issue, but just before you were discharged…..it was standard practice to take one with you as sort of a going away present. How did you get past the quarterdeck security with it…….simple…..you wore two off and returned with one. I too have enjoyed the book. it for me but you might like to tidy them up. I am a 38 year old male American. My normal reading material consists of Lee Child and Brad Thor type books. I read your interview in BookPage, and felt compelled to read your book. I am so glad that I did, your book pulled on emotions that other books never have. I really felt drawn into each character, and could feel a sense of what it must have been like for them. Thank you for writing such a great book. As a man in my early seventies with four unfinished novels, my gift in life is when I come across brilliance. By pure luck, my wife brought home “Little Bee”. I do not have the expertise to tell you how this work of art consumed my entire body and mind. You have been blessed with a gift and thankfully you have shared that gift with us. Congratulation to an outstanding authorship! I don’t even know how to phrase my appreciation, but let me start by saying that your books all have the exact and perfect mix of a plot one cannot but continue to read, and a marvellous way of using language in the most beautiful and expressive way. As a non- native English speaker (I’m Swedish) I don’t really know how to put it, I just love your books – and I do read v e r y much of all sorts. Since I read The Other Hand and shortly after (of course!) found Incendiaries you became my favourite writer. When Gold was published I was even more convinced and didn’t think it could get any better. But after just having finished the last lines of Everyone Brave is Forgiven I realised it could! One of the amazing thing with your authorship is how you how managed to make all books so different from each other. There is just no way of thinking ” I recognise this..” Which to me is a feat. Another very special talent of yours is how your books always transport you to another place/time/setting and raises an interest to learn more about that environment/setting. For example I know I’ll spend the rest of this evening reading about World War Two in Malta, just as I spent an entire night after having finished Gold watching speed cycling (which I previously didn’t even know existed!). No book has ever caused me to do such thing. I have read all of your books in both English and Swedish and can’t wait for Everyone Brave… to be translated in Swedish for my friends, fellow book club members etc to read. And for me to re-read. Finally, don’t make us wait too long for the next book! I am chronically ill with cancer and one of the many things that currently scares me is not being able to read all amazing books potentially being published in the future. It may seem a detail in comparison to the prospect of leaving life, family and friends, but it still saddens me. Once again, thanks for sharing your stories. What a lovely reply to this person who wrote beautifully and from the heart about your books. Your response doesn’t surprise me; it rings as true as the places and times and characters I have met in your first three novels – stories that I have talked about and re-read and passed on to friends; every book different, every one leaving their mark. I have just ordered Everyone Brave is Forgiven. Can’t wait. I’m hoping desperately that the non-inclusive language used so far by page 20 in the book is ‘just tongue in cheek’ as you try to portray the so called upper class characters in this novel. I can see where the plot is going and hope it gets less Downtonish! If you think the plot is “Downtonish” then I am honour bound to refund you for the book. Please let me know the purchase price and where I should send the cheque. On the contrary, I was struck by how cleverly your writing embraces the era. The prose reads as if it was written then,not in 2016. The same was true of Incendiary. I have never written to an author to express my sincere appreciation for transporting me into another time and place. I felt it would negligent if I did not tell you how special your book became to me. I’m going through something at work that I thought was overwhelming, and now I know that it is not and, if Londoners and Maltese could carry on, then so can I. I feel pushed to write something witty, because your language is so beautiful, but there is a reason you are an author and I am not. Thank you for this book. Dear Stacey, I can’t tell you how much your kind words mean to me. Thank you. When I was writing the book I was also going through some difficult stuff at the same time, and like you I found that when I thought about what my grandparents had gone through, it gave some helpful perspective. Hope everything goes well for you. Thanks for your kind words & for taking the time to write them. I recently lent my 86 year old mother “Everyone Brave…” while she was staying with me, thinking she’d enjoy it since she and her sister were two of the many children who were evacuated from London for long periods during the war. They were sent to a Roman Catholic boarding school run by nuns, which was quite an eye opening experience in itself. She loved the book and found it very emotional. Naturally, it brought back lots of memories of those times. While she bows to the accuracy of your historical research, several descriptions made her pause, put the book down and comment….she was very surprised that aerosol cans of hair spray would be used, saying she was sure her mother never used hair spray and she cannot remember anything in aerosol containers. She was also surprised that avocado would be on the menu at the Ritz in the war years, having never seen one in a greengrocer’s shop until she arrived in New Zealand in the early 1950s. She believes American Jeeps didn’t arrive in Britain till the very end of the war. And she believes ‘poster paint’ (as it marked the name on a gas mask case) was a later invention, or at least the name ‘poster paint’ was. Just little things, but they obviously stood out for her. Didn’t stop her enjoying it so much that she tells me she went on to read another of your books, non fiction, based on your grandparents’ letters to each other from just before WWI till just after WW2. I’m thrilled that your mother read the book – thank you for lending it to her – and very interested in her wartime experiences & how they relate to the novel’s accuracy. This comes at a useful time, since I am just this week going through the text to make corrections for the paperback version. I’d already caught “Jeeps”, which I agree is an anachronism, but hairspray and poster paint are news to me – I will research further, and correct them in the PB is necessary. Huge thanks to your mother for that. I think avocados can stay – I was amazed to discover what was on the menu at the Ritz, despite everything. I have just read “Little Bee” and found it quite an “eye-opener”. Can’t wait to read “Everyone Brave is Forgiven”. Just a short comment from one born in London in 1942; my parents told me many stories of their war times in bombed out London. This is the small comment: I believe we called hair spray “hair lacquer” (aptly named), and it was in a non aerosol spray container. Thank you again for your very fascinating stories. Just looked up history of hairspray (I’m compulsive like that) First produced in aerosol cans in 1948 apparently, after they were used for insecticides during the war. Loving the book, the evocation of the time and place – my mother was in London then – and the amazing use of language. I have just finished “Everyone Brave” and I can’t express the emotions I felt as I read this exceptional piece of work. Well done Chris. I hope it makes the list for “Canada Reads” so everyone here gets to partake of such a great book. I definitely can say it has been one of my best reads in many years. Congrats to you and thanks should also be given to your friend Matt. Keep it up please. I have to run and brag about my new author to all my family (we are all great readers) and friends. What a wonderful read. Your letters do not form words on a page; they seemingly migrate to each other as the need arises, from simple elegance to the heart of feeling. What a tremendous joy it was to read ‘Everyone brave is forgiven’. The previous books will now be at the top of my ‘must read’ list. Thank you for bringing language alive once again. God Bless. I have read Little Bee and Everyone Brave Is Forgiven. I was riveted by both of them and will go on to read the others. I just finished Everyone Brave and loved it, as I have loved all your books. I heard you interviewed on National Radio here in New Zealand and it was such a pleasure to hear your voice. I don’t think Alistair’s infected hand and Hilda’s gift of life to Mary will ever leave me… what a treat to be taken to blitzed London and sieged Malta these last few nights – sounds weird but I couldn’t wait to be transported there! I hope you make it to Auckland for a visit – who knows what story you would make of us! Loved loved loved this book! Have been struggling to find good authors, I’m usually serial killer bound! It made me laugh and cry. I’m not very good at writing reviews, but I had to write to let you know I haven’t enjoyed a book like yours in ages! I wish I knew what the future held for little Zachary, he was such a hero to me, especially looking after Mary. I must admit it left me a little melancholic not knowing if Mary and Alistair stayed together; it would have been so lovely for them to get away from London with Zachary in tow!! I never knew any of my grandparents but I believe my maternal grandfather fought in WW2. The older I become the more I love reading about history, especially both WW1 and WW2. The bravery and selflessness our ancestors went through always leaves me so very sad and angry that us humans never learn from the horrors of war. Your book has left a mark, you have a great gift, I am envious! Now I’m off to read more of your amazing works, any suggestions which one I try next? I am in utter awe of your book “Everyone Brave is Forgiven”, and would like to extend my gratitude for this work. I was profoundly moved by the writing style, your choice of wording, and the depth and range of human psychology you managed to portray within the characters. Although I am a stranger to you, I feel so proud of you, in that the talent, sensitivity, skill, and dedication necessary to actualize this accomplishment must be God-given, though operated through, and by you. Congratulations, thank you, and I very much look forward to reading more. As usual, I’m left in awe at your personality. You are such a beautiful human being. For you to spare time and reply your readers here enthralls me and I applaud you for that. INCENDIARY, LITTLE BEE & GOLD were excellent books for me. Unputdownable so to say. I even almost pushed duties forward just to get done with each. I just finished ALL THE LIGHT WE CANNOT SEE BY ANTHONY DOERR some minutes ago and it was set in WW2 like Everyone brave…. I enjoyed it. Hopefully, you’d deliver in this new born – EVERY ONE BRAVE is FORGIVEN. I always feed on the goodreads review and I think it’s having a good spot on the mind of readers. I have read and enjoyed all your books immensely,and have just finished Everyone Brave is Forgiven.I have never felt compelled to thank an author before,but I want to thank you for taking me to another time and place.I feel a bit disorientated,a bit unsettled,but in a good way ! I have a photo taken in 1915 of my paternal grandfather sitting on his mother’s knee,next to his father in his naval uniform,in Malta.That same year,on the 16th January,my maternal grandfather was born prematurely when his mother received a telegram to say her husband had been killed in action.My grandfather survived in a shoebox in the kitchen range.Both grandfathers were in the Army,and both died in the 50’s and 60’s,so I never knew them. My parents met in Malta in the 1960’s,mum in the Wrns,my father in the Navy,where they had a long love affair which as he was married,came to an end.It is hard to believe that only twenty years earlier there was such pain and hunger.I was born on the 16th January 1965,and mum met my wonderful stepfather (who was born in Gibraltar in 1940) in 1967. It’s the invisible thread that connects us to our past,isn’t it?I have an incredible urge to visit Malta,as I did not know as much as I do now,thanks to you Chris.Keep writing your amazing novels.I hope you love writing as much as I love reading! is Forgiven, came to be. we fed a group of young people from a local orphanage in our mess hall. PS Yes, I do like the family name. It has a certain built-in sense of adventure. And to Vatican City. Those places I saw on that 6 month cruise is what inspired me to be a history teacher. Even though I still work part time at 82, I do find some time for reading…..I will check out some of your other books also. Keep up the great work. I find it uncanny, how convincingly you speak through the voices of female narrators, especially in Incendiary and The Other Hand. Have to admit, was less taken by Gold, which seemed a bit more sentimental. I guess I find your brutally honest writing from the female perspective startling. Cannot wait to read your new novel. I must admit, you and Christos Tsialkos are my two favourite contemporary writers. I guess it must be the unsettling quality of your writing. I feel the outrage for the cruel twists of fate that befall your characters…. It’s odd, because both Incendiary and C.T.’s Barracuda left me feeling this way. Thank you for rocking me in my complacency……. Hi Robert, I was honoured to read this generous & interesting message from you. Thank you. Like you, I’m a big fan of Christos’s writing and have had the pleasure of meeting him a couple of times. It seems to me that he has a big heart in real life as well as on the page. I completely agree with you about Gold & if I could have my time again I would write it differently. It was the best I could do at the time, and it seemed good to me at the time, but looking back on it now I suspect it’s in my top 4 but not in my top 3. I think I’m back in the room with Everyone Brave & hope you will enjoy it! Thanks again for your great message. in the midst of “Everyone..” and gripped by it. I really am spending too much time thinking about HOW you write vs. What you write, but I find your style phenomenal – you have an internal rhythm to your prose, which remains recognizable, yet on the surface your book not be more different. It’s this ability to sneak into personalized voices and remain consistent with it. True mastery. WOW. Am this close to becoming a Chris Cleave groupie. Thus far, the only person I have been a groupie of was Anne Carson. Do you know of her? are you the Christopher Cleave I taught,in your primary years at Chalfont St. Peter.? Hi Shirley – yes I am! Hello – how lovely to hear from you! Just read about this on The Telegraph. Sounds splendid – right up my alley. I’ll definitely find time to read and enjoy this. Good luck. Hi Robbie – thank you, I hope you’ll enjoy the book. All good wishes to you in Tokyo! I am almost finished a review copy of Everyone Brave and hadn’t realised it was loosely based on your grandparents’ story. Amazing to see photos of them on this page. Brings their story even more to life. And how wonderful still to have their letters. Hi Joanne, thank you for reading Everyone Brave – glad you like the photos of my grandparents. I’m waiting very curious for your new novel, as I like your intersting stories. When can we expect to get here in Germany? Couldn’t find anything about it. I hope soon?? Hello – I am an editor and wondering why the ‘is’ in your title is not capitalized? Was this a purposeful editorial choice? To Julie Berger – Hello Julie and thank you for a very good question. From my POV it was simply an aesthetic choice. It is equally good, I think, to capitalise the shorter words in a title or to leave them lowercase. The canonical exception is to capitalise all verbs even if they are short – but my eye didn’t like the title with a title case “Is”, so I kept it lowercase. Chris: First of all, I am bowled over by your replying to people who post here. Don’t feel you have to in my case since my main purpose is merely to tell you how fine I think you are. I say that rather than congratulations on your writing because after I finished Little Bee I had this moment in which I had these contrasting thoughts come to me. One was to remember all the mess we have in this country and in the world because so many of us are mean and insecure. The other was more a feeling than a thought because all the goodness that I have received in a lifetime of reading just came flooding through me. It occured to me that there will always be fine people in the world if there are books written by people like you. Thank you. Now I go on to searching for your other books and waiting eagerly for your new one. Oh, and yes, congrats!!! I’m a French guy living in Thailand and I discovered your books in Indonesia 🙂 A guy in a small Javanese bookshop recommended ‘The Other Hand’ to me, and I was totally under the spell for the next 2 days. Unputdownable ! Then I purchased ‘Incendiary’ in Bangkok and, if possible, was even more enthralled. Totally disappointed, however, by the movie, which I saw quite a bit later, but then we all know how seldom movies do justice to good novels. When it’s a masterpiece the exercise is even more risky, I guess ! I’m very much looking forward to your new book, it feels like eagerly awaiting the arrival of a dear friend. Thank you from the bottom of my heart for your wonderful work. Congratulations on your new book, an extraordinary novel, a tour de force, brave, confronting, and beautiful. The book I’ve been waiting for since The Other Hand. Can’t wait to sell it at Avenue Bookstore in Melbourne? Looking forward to your next book tour to Australia. Hello from Sydney, Australia. I am waiting patiently for your new novel Everyone Brave is Forgiven to arrive in April. I hope you will tour, once again, in Sydney. You are always welcome! Good luck. I look forward to finally reading your new one. I so enjoyed each one of your books. I just missed seeing you in Seattle so am hoping that you will make it to Vancouver. Definitely will preorder Everyone Brave. 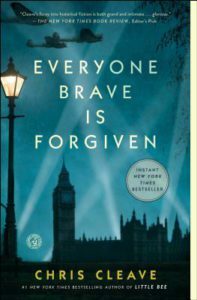 I received Everyone Brave is Forgiven through NetGalley and read it last week. I have been deeply moved and am rather haunted by the scenes and characters. Because the experiences of the characters were inspired by your grandparents’ experiences I have thought it had to be devastating to put Mary and Tom and Alastair and Hilda through such horrors. What was it like for you as a writer to put these lovely young people in harm’s way? I also think it so interesting that instead of idealizing the British people, which is what we usually see in America, you show the smallness of mind in the rich, the country folk who won’t take in imperfect or different children, blatant racism, and the bureaucracy that evacuated the zoo animals before the schoolchildren. I expect someday the book will be made into a movie. I fear that people won’t read the book first and the movie will become a war romance and scenes like Mary’s near drowning, or Simonson’s tasting the jam, will lose their impact. I’ve read a ton of books in my lifetime, of all genres. I’ve been moved by many of them. But never have I read something as powerful and as analytical of the human condition as your novel ‘Gold’. ‘Bridge to Terabithia’ by Katherine Paterson and ‘My Sister’s Keeper’ by Jodi Picoult come close to the level of excellence you have achieved in your writing. I consider myself lucky to have come across this book, while searching for books on Olympic athletes and the Olympics, which is also a passion of mine. Please continue to write like this. You are a force of good in this world, in these dark and desperate times. thank you. I would just like to say, out of every work I have read by a writer (and I am an English student so I have read an awful lot! ), your style and imaginative plots have to be applauded. In my eyes, you’re one of the greats, and a favourite writer of mine. Incendiary still haunts me. My name is Cindy. I am in the United States. Your book has been on my book shelf for years, but I am not quite sure how I acquired it. I picked it up last week and I just finished it this morning. It was a great read and I shared it on my Facebook page for others to read and enjoy. I love that you have included a reading group guide! I look forward to reading more of your work. I randomly picked ‘Anyone brave’ at Gatwick Airport because I had read ‘The other hand’ – thoroughly enjoyed it – and needed a new book to read. What a wonderful novel! I found it very hard to put it down when I had other things to do and found myself constantly looking for excuses to turn back to it. What I like first and foremost is the way you bring your characters to life, the vocabulary and stylistic devices you use. As a German teacher of English I had considered my vocabulary quite wide, but you taught me otherwise, and I loved turning to my dictionary and enlarging my vocabulary in the process. The open ending is what I also love about the book, not a romantic ‘and they lived happily ever after’. I would have liked though to find out what happened to Zachary…. Thank you very much for both the books I have read so far – as the summer holiday has just started I am now going to turn to Gold or Incendiary, I haven’t made up my mind yet. I hope very much that you will be invited – and accept the invitation – to LitCologne International Literature Festival soon so I can attend a reading. By the way I do not share Ms. Kirby’s criticism about Alistair’s buying his men drinks without a wallet- I understand this as a flashback which describes what happened before the attacks described. I have chosen Little Bee for my book club to read but they are having trouble sourcing it in England. I was given it by my Aunt and have since passed it on to someone else. I LOVED it so much and am really keen for us to read and discuss it. Could you tell me where I can get four copies asap!!! I picked up ‘Gold’ from a book exchange in the Iguana Perdida, a lovely hostel at Lago Atitlan in Guatemala. Written inside the book was “Read this, it’s going to struck holes in your soul and then fill them”. I was intrigued. That book was the first book ever that gave me the feeling of not wanting to stop reading but at the same time not being able to read any further. The suspense, the emotional grip the book had on me was unreal. An incredible experience reading it. Safe to say, you are my new favourite author. I’m looking at ‘The Other Hand’ at this moment and I’m definitely going to pick this book up as well! Cheers, keep on doing the good work :)! How will we know when you mean it? When is a writer a racist?